Water coming up thru asphalt and running down gutter. During busy commute hours (rush hour) there is a significant bottle neck issue with lights at the 540 exit 20 on and off ramp lights and the Forestville Rd/Buffalo Rd. Lights. Something needs to be addressed to remedy this issue. Nowhere else in Raleigh is there this much traffic congestion. There is change being made.. the light and Lanes on Forestville are being changed. There will be NO RIGHT ON RED from Forestville Rd to Buffalo because of the immediate street of William and Mary exiting in either direction. They have NO light so the incidence of an accident is diminished if no turn on red. The lights will be sincronized for extra added lanes East and West. Per Raleigh office of DOT. I own a business on Frazier Drive on the back side of 3810 New Bern Ave. Wendy's property has been vacant for over a year. Trash is being dumped in the dumpster corral (no dumpster) and around and behind that wall. Bad stench and eyesore. This could be where homeless people drop trash as well; not sure. If I knew the property owner, I would contact him since this is a public nuisance. Thanks for your attention. 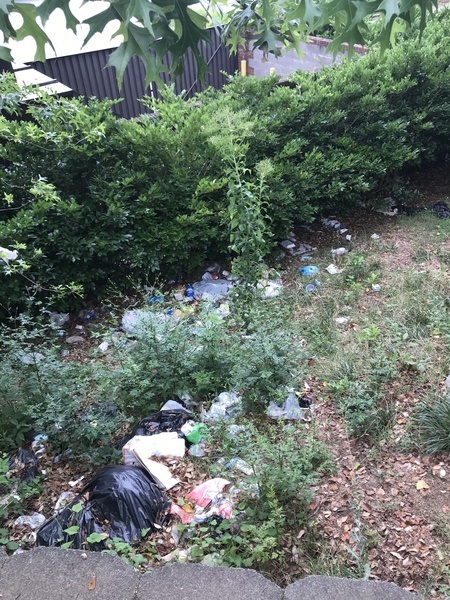 Everything at the Wendy's property and dumpster has been cleaned up; however, the area NEXT DOOR which is BP gas station at 3820 New Bern Ave. is very littered, likely by homeless. The areas that are bad are wooded, grassy, not part of their actual concrete thoroughfare. The Wendy's property has been leveled for future construction purposes. A dumpster corral remains which is full of unsightly items. The yard at back from Wendy's through the neighboring gas station, wooded mostly, is also a MESS. no attention has been given to my knowledge. Also from the beginning of Plainview Drive off of New Bern from the gas station, by the hotel all the way up to Virginia St. IT IS AWFUL. Folks stand around there all day and night and leave a trail of trash, grocery carts, etc. No pride. To me it looks like hotel property, some vacant lot property and some property belonging to the gas station on the corner of New Bern and Plainview. We all know this is a high crime area and many ne'er do well's hang out on that road, outsiders are making the mess I am sure. But mgt of those properties need to take action. City side cleaned, other side remains a trash pit, almost 2 months later. Without a street address, map, or a photo, it's rather unlikely that either CoR or NCDOT are going to do anything about this, unfortunately. This is a continuous issue. IS there anything that can be done. Like night cameras? There is litter along the stretch of Southall Rd between Buffalo blvd & Southall intersection and Southall & skycrest intersection. Also all along Skycrest Rd and Buffalo. There is a huge mass of tree branches leaning into the southbound bike lane on Faircloth Street approximately between Brookwood Drive and Ruffin Street. The branches create a wall and completely obstruct the bike lane such that if someone were to ride into them, they would not pss through but be knocked off their bike. I got caught in the rain biking in this lane yesterday and didn’t see the branches until the last second. I reflexively swerved into the car lane, which was fortunately clear or I would have been hit. I live in Highland Creek neighborhood off of 401 Louisburg Road and an intersecting road is Forestville Road. So starting at the intersection of 401 Louisburg Road and Forestville Road, going towards Wake Forest so towards the 2400 block of Forestville Road, there is ALOT of litter along the sides, both sides of the road!! I go to the Publix in Wake Forest, so every time I drive down Forestville I look at all the litter. I pick up trash in my neighborhood while walking, but would greatly appreciate it if someone would pick up the litter that has been thrown out on the sides of the road! Thank you so much! Bad around the 2000 and 2400 block of Forestville Road! Thank you for picking up! As Timberlake Community is entered from Lake Woodard, the roadway markings are faint or non-existant as you enter/exit the neighborhood. This is a safety hazard and needs to be addressed quickly.